We know all of the things that we are supposed to do in Memphis, but what are the unconventional things to do in the city? You can find plenty to do and see when you make plans to visit Bluff City, but instead of the conventional things to do in Memphis, check out some not-so-conventional activities. Here are some unconventional places to go in Memphis when you come to visit. One of the most unusual things to do in Memphis is to visit the Peabody Hotel to watch the ducks. Ducks at a hotel? Yes, a tradition since 1933, when the first team of ducks, Peabody, Gayoso and Chisca, graced the lobby of the formerly named Memphis Hotel Company. The ducks, one male and four females or hens of the North American mallard type, maintain residency on top of the hotel’s roof in a specially built duck palace. Every day, at 11 a.m. and 5 p.m., the ducks make their walk from the roof to the lobby where they can be seen by guests and visitors alike. Fun fact: Although the hotel features a French restaurant, there is absolutely no duck on any Peabody Hotel menu! On your tour of the unconventional things to do in Memphis is a visit to an Egyptian pyramid. You may not be aware but the city of Memphis, TN takes its name from the ancient capital city of Memphis in ancient Egypt. The city was located at the mouth of the Nile river, which seems about right given the present-day city’s location on the Mississippi River. One thing that both cities have in common are pyramids. The Memphis Pyramid, which sits at the mouth of the Mississippi, is home to one of the largest Bass Pro Shops in the U.S. and was known in the past for hosting college and professional sports. If you think hanging out with a bunch of pampered ducks is unusual, how about a group of beer-drinking goats in downtown? No, this is not a typo. 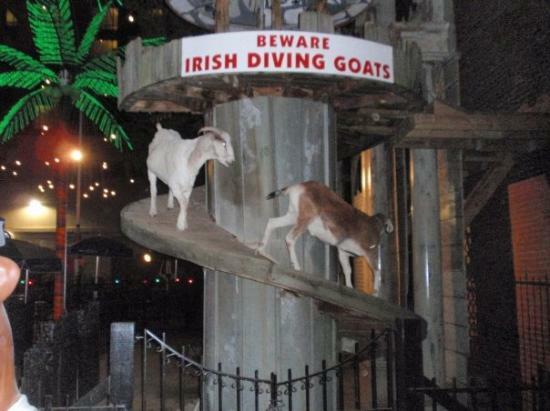 Silky O’Sullivans, a bar located in downtown Memphis on famous Beale Street, features two female goats. The goats are known to roam the grounds of the bar, in their tower, looking down on bar-goers and occasionally conning a beer or two off an unsuspecting patron. The goats are treated well by Silky himself, who may share a story or two with you on how they came to take up residency at his bar. You can walk across a five-block replica of the lower Mississippi River. The Mud Island River Park is designed to give you the experience of striding, on scale, the entire river area from Cairo, IL to New Orleans, LA. Once you take your journey, learning how the river flows from state to state, you can step into a 1.3 million gallon pool that replicates the Gulf of Mexico. There you can ride paddleboats and enjoy your trip across the mighty Mississippi. There are many different ways to enjoy Memphis. So, look for these and other fun and unconventional things to do in Memphis! Looking for more stories on what makes Memphis great? Follow our Instagram page below! Here’s what happened in Memphis for the week of 03/24/2019!